A response to Art Versus Sport, inspired by the five olympic rings and the Paralympic values. Disabled people are often placed in the same ‘box’. Arts and Sports are now also placed together as we head towards London 2012. What overlaps exist? What are the lines of tension? What is the common ground? Arts Versus Sports is a Yorkshire project, coordinated by ADA inc, focusing on the creative responses of disabled artists to the complex overlaps between art, sport and disability. It aims to stimulate discussion to enrich and deepen Yorkshire’s position as we all head forwards towards 2012 and the Olympics, Paralympics and Cultural Olympiad, and to help disabled artists in the region showcase their work and raise their profile. The region was the starting point: Yorkshire has world-class disabled athletes and internationally recognised disability arts companies and artists – how can we maximise the potential we have, whilst also acknowledging our differences? So three disabled artists were asked to explore those differences and create responses to the title ‘Arts Versus Sports’. Steven Harrison suffered spinal cord damage in 1998 and retrained as an artist. He is currently studying for a Masters Degree in Art Psychotherapy and plays wheelchair rugby. For Arts Versus Sports, he created a piece, inspired by the five olympic rings and the Paralympic values, which include courage, determination, inspiration and equality. 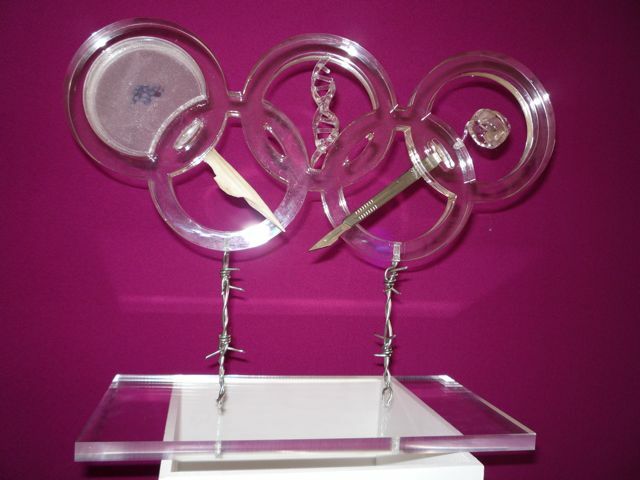 The clear perspex rings are raised up on barbed wire, to show the painful reality disabled people face - in their daily lives as well as in working to gain recognition in sports or arts. Each ring contains a different element – a representation of the rubella virus in a petri dish, of the double helix of DNA, of a human embryo, a shard of bone and a scalpel – each illustrating a different aspect of the heritage of disabled people. Edmund Davies is a professional learning disabled actor who works full time as part of Mind The Gap’s Acting Company. Through Mind The Gap’s Agency he has played the part of Chris Taylor in ITV’s ‘Cold Blood’ and most recently as Tom, alongside Sir Ian Mckellen in BBC Radio drama ‘Walter Now.’ His response was a performance piece highlighting the discrepancies in the ways that different disabilities are treated within both arts and sports, and how learning disabled people are marginalised within both. The next step in the programme is to showcase the work of Simon Mckeown, an established digital creator with a radical interest in representing disability in new and innovative ways and creator of the Motion Disabled exhibition.